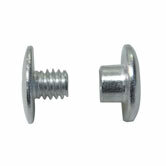 Aluminum screw posts (AKA chicago screws) are used for binding photo albums, scrapbooks, samples, blueprints, leather products, store and trade show displays, and thousands of other items. They can hold hundreds of pages, yet can be assembled and disassembled using only your fingers. No expensive binding machines to buy -- just a simple paper punch and you can get started. We also offer a large selection of Paper Cutters, Laminating Machines, Coil Binding, GBC Binding and Tape Binding Machines. Consult with our knowledgeable staff if there is a particular machine or product you require. We sell all posts in packages of 100 posts and screws. For most uses, you should make the hole slightly larger than the post. 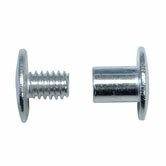 A 1/4 inch hole is recommended for most applications of aluminum screw posts. The posts will be slightly smaller than this hole, which makes inserting the posts easier, and allows the pages of the document to spread, making the inside pages of your document easier to read. For holes in wood, metal, plastics, etc., use a drill press with a bit suited to the material. Research the material you want to drill online, or ask someone with experience in using that material. Your supplier can probably give you some suggestions. Screw posts are one of the easiest and least expensive solutions for binding very thick books. They're the best choice for keeping a thick sheaf of printouts together and in order. We stock screw posts in lengths up to 5 inches, and you can make even longer lengths by adding extensions. For large books, select screw posts that are longer than the thickness of the book. The larger the book, the more extra space you should leave for the inner pages to be readable. If you often have to bind books of various sizes, keep a supply of screw posts and extensions to assemble for a proper fit.Add covers to help keep the outside pages from tearing or the posts from pulling through. Screw posts are available in lengths starting at 1/8 inch. These tiny posts are suitable for only a few pages. Remember to select posts long enough that the screw can be firmly tightened to the post. 1/8, 3/16, and 1/4 inch screw posts (and 1/4 inch extensions) use special screws to fit the short post bodies. Keep the screws with the posts in these sizes to avoid using the wrong screws. Screws that are too long will not seat properly and may protrude through the bottom of the post, or not completely tighten on an extension. 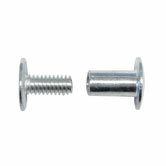 We also sell extra screws for all sizes if you need them. Screw posts can be used to connect leather pieces to make cases, straps, holsters, tack, and many other items. They are ideal for anything that needs to be securely fastened but must occasionally be disassembled. You might want to use colored screw posts if appearance is important in your application. Leather connections often have to take a certain amount of strain. To help them hold better, make the hole 3/16 or 7/32 inch in diameter. Use a good quality leather punch to make the screw post easier to insert. Also, choose the length of the post carefully. It should be long enough to tighten the screw firmly against the post, but not more than the combined thickness of the leather pieces. Screw posts can be used to assemble many types of signs, retail displays, trade show exhibits, and similar items.Use whatever materials you want, then drill or punch 1/4 inch holes for the screw posts. Select the screw post length to be the same or slightly greater than the total thickness of the materials you are assembling. If you are going to a trade show or offsite location, pack a few extra screw posts of the appropriate length in case you drop one. You can use document covers that fold over the post heads to conceal your screw posts. You can also use screw posts in black, gold, or antique brass and show them as a design element. These posts are the same aluminum as the ones on this page, but with a hard colored coating. For a completely different look, we stock plastic screw postsin black and white. 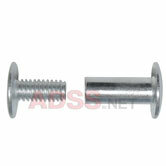 For greater strength, we stock steel screw postsand extensions.